Tresca in Italian translates to “intrigue”. 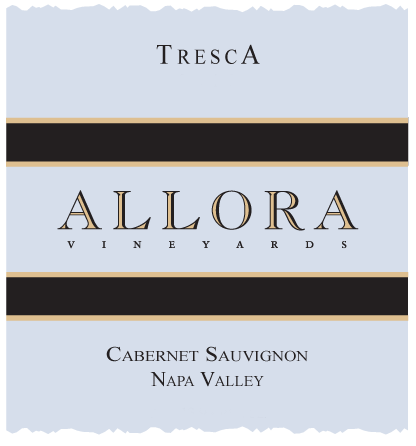 This was the first wine that Allora Vineyards ever made, back in 1997. All the fruit in this intriguing wine is grown on our own estate at Allora Vineyards in St. Helena. This wine has aromas of, nutmeg, all-spice and red berries with hints of honey and coffee concluding with a velvet-like texture and silky finish. This rich, layered wine has aromas of jam, mocha and viloet. The tannins are beautifully integrated and the wine has a long, satiny finish. The color is a deep purple with aromas of black liquorice, clove, nutmeg, leather and red currant. It is round and balanced with a clean, memorable finish. This flavor Profile is rich with black cherries, blackberries and hints of semi-sweet chocolate and we find Tresca pairs well with steak and pastas. Tresca has deep, rich flavors of ripe berries and dark cherries pairing beautifully with deliscious steaks and dark chocolate. A deep and complex wine with ripe fruit flavors a smooth finish and a round mouth feel. It complements a wide variety of foods, including grilled meats and artisanal cheeses. Another wonderful year, resulting in an unsaturated crimson hue and a fascinating mix of thyme, dill, and bright cherry aromatics while youthful in its approachability. These complex aromatics are complemented by sandalwood and nutmeg characteristics. It is full bodied with a fresh fruit entry as well as an elegant acidity. This wine displays an opaque garnet color with a bouquet of blackberry liqueur and hoisin sauce. It also offers the savory components of sage and molasses. Dark ruby-red color and a rich nose of black cherry, rose petals and roasting meat. It has a great attack, a juicy mid-palate, great acid balance finishing long with grainy tannins. A well-structured wine with a compact, rich mid-palate buttressed by silky tannins and generous acidity that artfully combines the elegance of the old world and the ripe fruit of California. Two deceptive heat spikes coaxed the vines to an early bloom and harvest. August cooled to perfect temperatures allowing grapes to settle and extend the all-important hang time producing remarkably good fruit. Flavors of sage and blackberry with strong acidity in the mid-palate is followed by a lingering finish. It is both rich and deliscious. A dark ruby color entices you with a nose of raspberry, cassis and loose pipe tobacco. This full-bodied wine has an assertively silky structure and is notably spicy on the palate.